LUXO VIP (Variable Inclination Position) stereomicroscope, 8x-50x zoom range with 10x eyepieces. Tilting viewing tube ensures proper posture during use. ESD-safe powder coated metal laced paint. 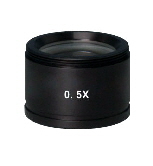 8” working distance when used with the included 0.5x auxiliary objective lens. Dual boom roller-bearing stand included. 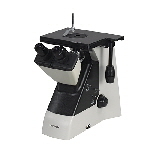 System 373 ESD-safe trinocular stereomicroscope, 7x-45x zoom range with 10x eyepieces. Powder coated ESD safe metal laced paint. Packages include auxiliary objective lenses of various magnifications and trinocular body with included USB 2.0 digital camera. Dual boom roller-bearing stand included. 8x-64x and 8x-50x zoom ranges. Preconfigured packages include stereomicroscope with plain focusing stand, coaxial coarse-fine focus stand with LED illumination, boom stand, and dual boom roller-bearing stand. A dual viewing system is also available. illuminator, boom stand and dual boom roller bearing stand. Z850 Series 8x-50x zoom range with 10x eyepieces. Binocular and trinocular versions available. Preconfigured packages include plain focusing stand, pole stand, coaxial coarse-fine focus stand with LED illumination, gemological stand, diascopic stand with rear port for fiber optic illuminator, flex-arm stand, boom stand and dual boom roller-bearing stand. FS30 Series Fixed magnification stereomicroscope with dual magnification settings. Available in 1x/2x, 1x/3x and 2x/4x magnification settings. 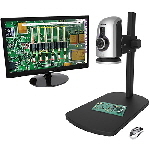 Preconfigured packages include stereomicroscope with plain focusing stand, coaxial coarse-fine focus stand with LED illumination, pole stand, boom stand, and flex arm stand. 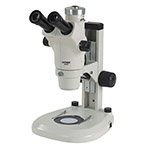 Z730 Series 7x-30x zoom range with 10x eyepieces. Ideal for final inspection, quality control and assembly. Preconfigured packages include plain focusing stand, pole stand, coaxial coarse-fine focus stand with LED illumination, gemological stand, diascopic stand with rear port for fiber optic illuminator, flex-arm stand, boom stand and dual boom roller-bearing stand. 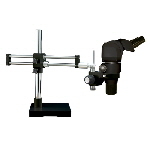 Stands Most of Unitron’s microscopes can be configured on various stands to meet your requirements. These include plain focusing, coaxial coarse-fine focusing, glide stages, LED stands, pole stands, gemological stands, boom and ball-bearing boom stands, flex arm stands and bonder arms. Please inquire for additional details. Objectives and Auxiliary Lenses Depending on your requirements, the magnification and working distance of Unitron stereomicroscopes can be changed by using auxiliary lenses. The auxiliary lenses are model-specific and include achromat, plan achromat and plan apochromat versions. 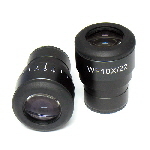 Please inquire for details of available auxiliary lenses for your choice of stereomicroscope. 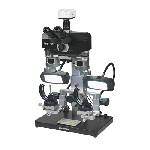 Eyepieces Options are available, depending on the model of stereomicroscope. The options include 10x, 15x, 16x, 20x and 30x. 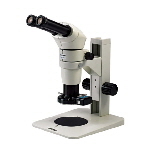 Inquire for details to match a set of objectives to your choice of microscope. Inspex HD 1080p Digital inspection station with HD images at 60fps. Integrated LED illumination system. HDMI and USB 2.0 outputs. Options include LED ringlights, fiber optic illuminators, polarizers and auxiliary objectives. Various stands and mounting options are available. 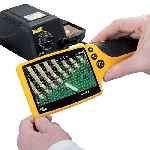 ion 4.3” Hand-held 4.3” digital magnifier, with integrated LED illumination and image capture with dimensioning grids. Stores up to 100 images in 480x272 format. Micro USB output for image transfer to computer. Ideal for portable inspection and hard-to-reach .areas. 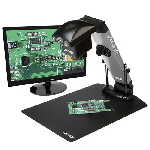 OMNI Stand-alone digital inspection station with onboard software for imaging and measurement, no computer required. Capable of staying in calibration over the entire zoom range. Options include LED ringlights, fiber optic illuminators, polarizers and auxiliary objectives. Monitor not included. Recommended monitor is Full HD 16:9. Unitron provides LED-based illumination systems for all applications. Products include LED ringlights, LED quadrant ringlights, LED 8-point ringlights, LED goosenecks, dome lights, polarizing ringlights, and the Dolan-Jenner line of LED ringlights on goosenecks and for mounting on microscopes. Please inquire for more details. 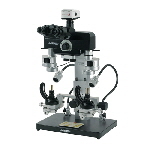 EXAMET-5 Upright metallurgical microscope designed for brightfield metallurgical applications. Trinocular viewing head with 100/0 and 50/50 split. Plan Achromat 5x, 10x and 20x objectives and Semi-Plan Apo 50x objective. Models available with reflected and reflected/transmitted light illumination. Both Illumination sources are 5 Watt LEDs. Options include digital cameras, 100x objective, 16x eyepieces, polarizer and analyzer, yellow, blue, green or neutral density filters, measuring reticles and stage micrometers. MEC4 Inverted metallurgical microcope, designed for brightfield and simple polarization observation. Trinocular viewing head with 100/0 and 80/20 split, Plan Achromat LWD 5x, 10x, 20x and Semi-Plan Apo 50x objecives. Attachable mechanial stage with right-hand coaxial controls. 5 Watt variable LED illumination. Options include digital cameras, 100x objective. Crossline, grid, Austentite grain sizing and custom pattern eyepiece reticles. microMET Compact, designed for routine metallurgical applications. Binocular viewing head. Plan Achromat 10x, 20x and 50x objectives, optional 5x and 100x dry objectives. Integrated mechanical stage with teardrop and circular hole stage plate inserts. 20 Watt variable halogen illuminatior with bulb centering adjustment. Integrated green, yellow and neutral density filters. Optional crossline, grid, Austentite grain sizing and custom pattern eyepiece reticles. 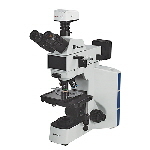 12100 Polarizing Microscope Series For industrial and university-level examination of birefringent materials. Available as binocular and trinocular (50/50 split) versions. Quintuple nosepiece with one centering position. 4x, 10x, 20x and 40x Plan Achromat strain-free objectives. Polarizer and analyzer are both 360° rotatable. λ tint plate, 1/4 λ retardation plate and quartz wedge. Variable 5 Watt LED illuminator. A series of modular, interchangeable components to meet the requirements of machine shops and inline parts assembly. Can be attached to precision alignment and drilling machines as well as bonding, inspection and probe stations. Please contact us for additional details. holders, bullet holders and cartridge holders. Options include 16x, 25x and 30x eyepieces; 0.4x and 2.0x auxiliary objectives; digital and HD cameras; transmitted light stages for viewing transparent or translucent specimens; polarizers. Perfect for awards, presentations, incentives and gifts! Tabletop telescope on tripod with interchangeable eyepieces for 15x, 20x and 30x magnifications. Handheld telescopes available in 8x, 10x and 30x magnifications. Walnut presentation chest for 30x handheld telescope is custom designed and made to order. 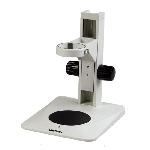 Tabletop Magnifier provides 5x magnification. Made from solid brass with 3 gold-plated support legs.